Home » Generations / Classics » RUMOR – Leader Class Ultra Magnus Incoming? RUMOR – Leader Class Ultra Magnus Incoming? TFW2005 boards member DecepticusPrime has shared a very intriguing piece of information with us. While scanning through the Leader class Transformers items at the store he works at, he found the AOE Leaders, the 2 upcoming Leader Megatrons, and Leader Thundercracker. This is all, of course, old news. 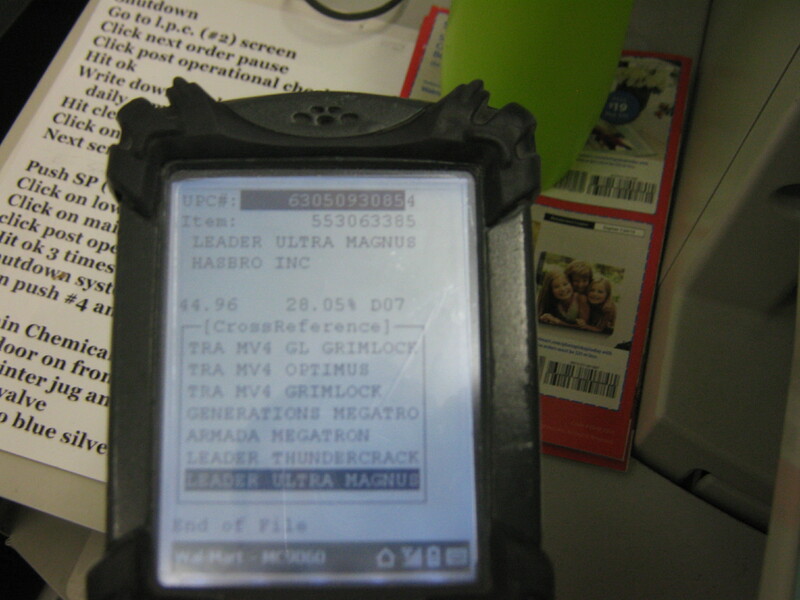 However, upon scanning through, he also found a listing for a new, previously-unknown item – a Leader Class Ultra Magnus. Take this with a grain of salt for now, but if true, what exactly could it be? Might Hasbro finally be giving us a “complete” Ultra Magnus with full Magnus armor? Will it be G1-based, IDW-based, or something else? Or could it simply be another white redeco of one of the past Leader Optimus Primes? Whatever the case, if legitimate, there is a good chance we’ll be hearing more about it the closer we get to Toy Fair in February. Preorder up at The Chosen Prime. We'll most likely see him revealed at NY Toy Fair (14th-17th February), along with Devastator and the other third wave figures (i.e. Protectobots, Viper, Warpath). As for when he'll come out, that's anyone's guess. Retailers are currently soliciting the first wave of Leaders for mid-January, but it looks like the gaps between waves are going to be all over the place next year, considering the second waves of Legends, Deluxe and Voyager are also due at a similar time. Why do we need more than one? 'Corroboration' springs to mind. We haven't had much else to go on so far. Yenksta, would you be able to tell us a little more about this and are you working in a upgrade kit for it? It didn't sound like a CW remold from what I remember. I believe he said it looked a lot like MP Ultra Magnus, just slightly smaller. Just remember, I'm going off of my recollection here. I'm not trying to put words in his mouth. Even if it is G1 I still wonder if it's a CW Optimus remold. After seeing the new pics of him and his mode of "Ultra Prime." I don't know… I just needs pics. Why do we need more than one? I think he even posted a pic of the screen. I'm surprise not more people confirm of seeing Leader UM in the computer listing. So far only one person mentioned of seeing from the computer listing, doesn't anyone see it too? For my 2 cents: This could be a redeco/retool of Transformers Prime: 1st Edition Optimus. This would be a more show accurate version that the Magnuses (Magni?) that have been released previously. Regardless I anxiously await the confirmation and official release. I love the character in all of his many incanations and will be happy to add another iteration to my shelves. Venksta has seen it. He says it's G1, so it's probably G1. He's not usually wrong. I don't think so. Even if the new leader class size is smaller, it's not voyager size. Plus, the way FE Prime transforms wouldn't allow room for Magnus's shoulders without some massive retooling. That being said, I'd totally buy that if it was indeed the case, because I love the heck outta Prime Magnus. What if its the new Voyager Prime with a trailer? I wouldn't mind a mix of G1 and IDW. I don't think IDW Ultra Magnus looks like his Prime counterpart so I hope it's based on IDW UM. I can see them going the G1 route with the way it looks, wouldn't an IDW UM kind of have a Transformers Prime Ultra Magnus look to it, maybe they didn't want to retread that style??? I hope it's not a retool.